Jimmy started making baskets in 1958 and he hasn’t stopped. 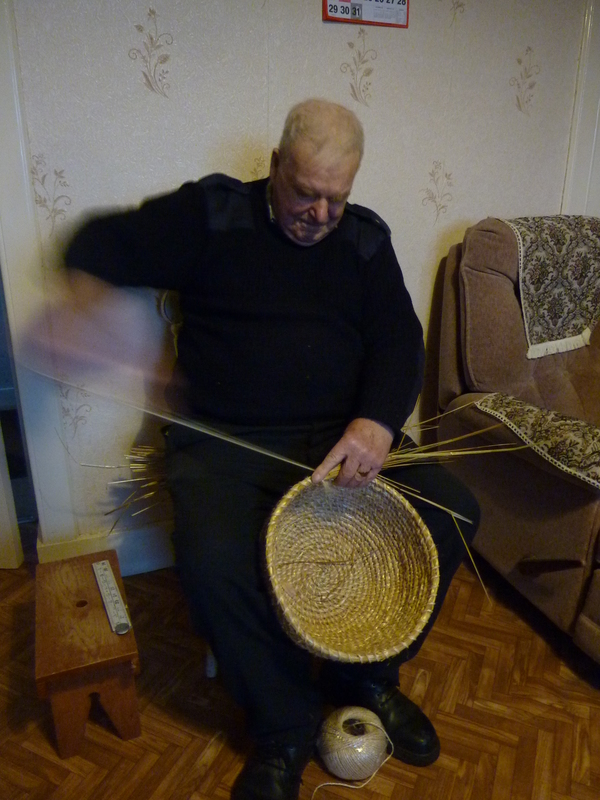 He says he taught himself and today at 88 he still makes the fine simple elegant coiled baskets that have become his trade mark. These are not traditional agricultural baskets like the kishie or fishing baskets such as the budie, these are domestic baskets for laundry and knitting, to hold peats by the fire. These are 1960’s post herring trade, oil boom baskets used to decorate the home with in a much less hard and more leisurely life. Jimmy has made hundreds of them, he doesn’t know how many, and they have been sent to all parts of the world – he is a one man industry. His hobby, for that is what it is, has created a tradition and people come from all over to film him, talk to him and buy his baskets. Jimmy sells everything he makes and selling them is very important to him, he has little time for people that visit and do not buy! Most of his working life he spent painting and decorating for a building contractor, with his basket making almost a second job. He worked at it for an hour in the morning prior to the day job and several hours in the evening on his return home after a long day with the paint brush. 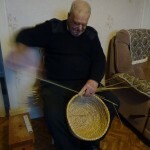 Jimmy says he can always recognise his baskets because he makes them without adding extra lines of stitching on the sides. There is the same number of stitches at the edge of the base as at the top edge regardless of any outward flow of the form. They are beautifully crafted, sturdy, functional and elegant baskets. He has never had any desire to alter his technique or his materials and it is probably because he has always made them the same way that they are so good. I asked Jimmy if he had ever taught anyone else to make them. I had heard whispers on the wind that he had refused to teach a woman who had offered to pay him for tuition. Apparently he told her that a woman would never have the strength to do it. I didn’t ask him if it was true, nor did I dare tell him I make baskets but I am very glad to hear that he is now passing on his precious knowledge to a couple of people – both male! By Lois Walpole.